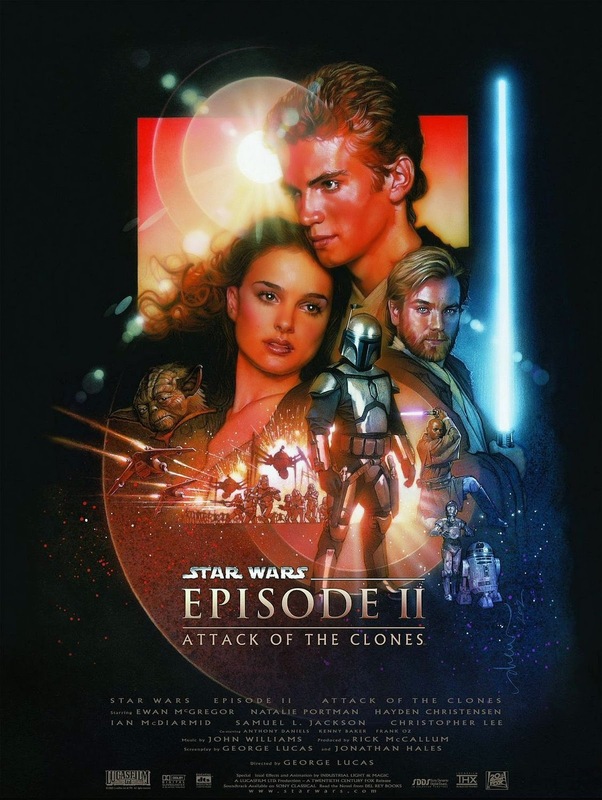 Here is another facts and bonus content from the second episode of the Star Wars series - Attack of the Clones (2002). Look carefully at the head statues in the Jedi Archives that Obi-Wan visits in Star Wars: Attack Of The Clones. The busts are sculpted in the shape of some very famous Star Wars faces including George Lucas, animation director Rob Coleman, model supervisor Brian Gernand and visual effects supervisors Pablo Helman and John Knoll. A secluded lakeside retreat in Lake Como was the romantic setting used as the location for Anakin Skywalker and Padmé Amidala’s first kiss. George Lucas was on vacation in Lake Como – and in the process of writing the script for the movie – when he decided that the ultra romantic setting would be perfect for the film. The scene where Anakin Skywalker and Obi-Wan travel in an elevator at the start of Episode II wasn’t in the original script. George Lucas wanted to add an introductory scene to the movie to show how well these two characters get along, even though there is a little tension between them in the scene that follows. C-3PO actor Anthony Daniels makes a cameo appearance in the movie’s club scene behind Obi-Wan and Anakin Skywalker. Daniels is not in his C-3PO outfit for the shot, but the actor’s face is clear to see. Can you spot him? The calm Kaminoan race appears briefly in Attack Of The Clones. They are a very graceful and serene alien race – but they were completely CG in the movie. Fashion models and the elegance of tai chi inspired the movie’s animators in creating Kaminoan characters Taun We and Lama Su. Did you know that one of the first sounds Ben Burtt worked on for Star Wars was the sound of the Wookiee? Over the years, the movie’s creative team has gathered almost a million different sounds and sounds effects in their mammoth library and archive collection. Ben Burtt used an unlikely tool as inspiration for the deep, roaring sound of the Star Destroyer at the start of Episode IV: A New Hope. During a night in a hotel, the sound designer heard a heavy rumbling sound and decided to investigate. An air conditioning unit was the cause of the rumble, so Burtt put a microphone on top of the unit. That sound eventually became the roar of the Star Destroyer. Australia wildlife served as the unusual source for a number of significant Star Wars sounds. The mating calls of penguins were recorded in Melbourne and the sound of fruit bats fighting over a banana was recorded in a rainforest in Cairns. They were mixed together to create the iconic sound of the Geonosian species in the Star Wars movies. Take a look at some of the most iconic wardrobe pieces in cinema history in this exclusive bonus feature. And discover some interesting insight into the costumes of Darth Vader, Boba Fett, Han Solo and other fascinating Star Wars characters. In order to make the masks of the Tusken Raiders, prop designers raided a number of plumbing stores, hardware stores and camera stores in England. They picked up whatever they thought would work for the fearsome desert savages. George Lucas is a huge fan of the Samurai. In fact, the chest plate and mask of Darth Vader’s costume reflects his fandom of the iconic Japanese warriors.